Code Welding & Mfg. is a job shop that offers metal fabrication services and specializes in providing welded assemblies. This is what we do best! A culture that delivers bottom line results creating wealth for our organization and its employees. A culture that leverages technology and processes at specific times. Code Welding & Mfg. Inc. provides fabricated metal products for the commercial or government sectors. We provide parts to customer specific requirements. 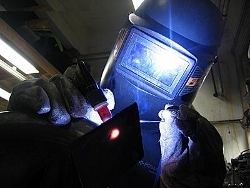 With more than 20 years of fabrication experience in various core competencies, customers have come to expect high-quality workmanship associated with Code Welding. Code Welding & Mfg. Inc. has an extensive background in welding to support customer-driven AWS standards. We also support government prime contractors’ with their custom products. Whether mild steel, stainless steel or aluminum, our experienced associates take pride in delivering our mission.